The Easter holidays are upon us! Whether you're wanting to egg-cite the little ones with an Easter Egg hunt or you just love getting into the theme with egg-strordinary decor, our stores have you covered! 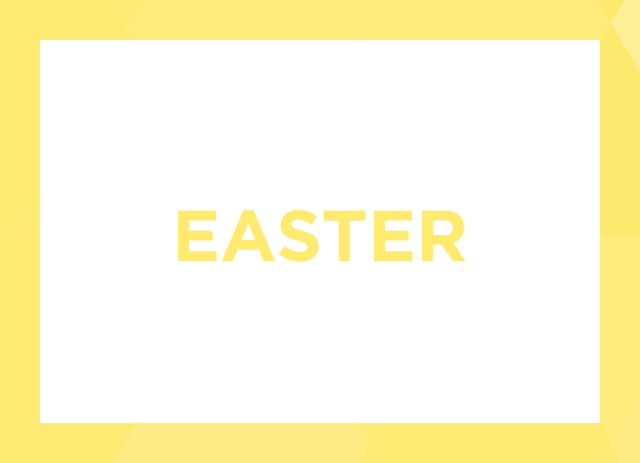 In need of some cards to send out your Easter wishes for your nearest and dearest? Poundland have a fantastic selection in store and they are 4 for just £1! Treat your little one to the cutest Easter outfit! This Spring fresh Primark dress with matching knickers is perfect for a family get-together, and she'll definitely be the star of the show! Have you seen a cuter pair of shoes? We think not! Hop on down to Debenhams to find these Ted Baker beauts in the Children's department! Who doesn't love a bit of bunting? Deck your halls with seasonal bunnies and carrots from TK Maxx- such a cute way to get into the Easter spirit! Keep the little ones entertained over the Easter holidays with the great range of toys and crafts available in store at Poundland, including this cute solar powered nodding chick! Transfer the Easter-Egg hunt basket into your wardrobe for the season's hottest accessory, the basket bag! This Oasis at Debenhams bag is a great size for all the essentials and will keep you looking bang on trend! Searching for a cute seasonal gift for somebunny special? How about a pretty Chamilia charm from H Samuel? This little bunny in a basket is adorable! Sometimes, you just need a dippy egg and soldiers in the morning? Why not treat yourself to some cute egg cups for a leisurely breakfast in bed over the Bank Holiday weekend? Sick of your tea towels looking a bit grim & grey? TK Maxx are here to save the day with this pretty floral bunny style! They may make washing up slightly more pretty but we can't promise it will be more fun! Obviously we can't do our top Easter picks without including a bit of chocolate, and Poundland have that side covered for sure! Find your fave flavours in store for just £1... you can't even feel guilty about treating yourself!